My dream of becoming a lingerie model slash astronaut will never come true, but my other dream of making fun of people is in full bloom. If you’re wondering why I threw up all over your dress that one time, it might be for one or all of these reasons. This is on the same level as laughing at the handicapped, because hipsters can’t help being stupid. A scientist that I followed home from the university said it was the lead-lined cans they use in Pabst Blue Ribbon. The brain damage makes you wear strange socks and ride fixies. A man’s shoes should always match his belt, in the same way the length of his beard should match the length of his hair. This look is meant for Civil War reenactments or the recently incarcerated, not human resources managers who shop at Whole Foods. The songs make my ears bleed and the story was less exciting than the nutrition information on a can of SPAM. To be fair, the North Korean animators did a bang-up job. Nothing causes me to fly into a rage faster than an unexpected auditory assault. Telephones are banned from my presence, apart from when Uncle Debbie comes to visit. Then it’s just one long stream of creditors calling, day and night. They aren’t as smart as humans no matter how much you scream it outside my bathroom window. At least they won’t eat you after you die alone and unloved in your apartment. They aren’t as smart as humans and their photos are dragging down the electronic communications of the Western world. Also, they’ll eat you. 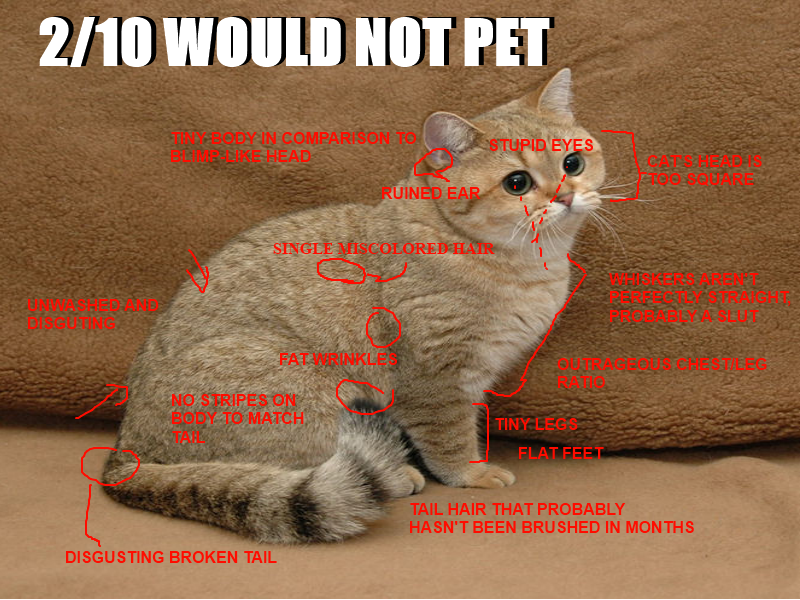 Sorry, insult cats, earn rage.